I am the Senior Library Specialist at the Journalism Library. I have over 27 years experience helping patrons with research, technology and outreach. The MU Libraries now subscribes to five ProQuest Historical Newspaper databases for The Chicago Tribune (1849-1990), The Wall Street Journal (1889-1996) and The Washington Post (1877-1997). 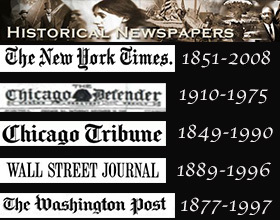 We now have access to five historical newspapers: Those mentioned above plus the historical New York Times and Chicago Defender. Access is available from the libraries’ database pages and on our Find News – News Databases page.